Saturday morning began with shocking and tragic news for Serbia and its citizens. Military rescue helicopter MI-17, with seven people on board (two pilots, two mechanics, a doctor, a medic and the five-day-old baby they were rescuing), crashed on the perimeter of the Belgrade airport. This was a tragedy in and of itself, but also a symptom of a broader problem. Parts of the media and the public accused the Minister of Defence Bratislav Gašić and Minister of Health Zlatibor Lončar of ordering the helicopter crew to rescue the baby from southwest Serbia under bad weather conditions and bring it to Belgrade, rather than to a closer hospital in a central Serbian town with better weather conditions. The Ministers were apparently awaiting the helicopter at the Belgrade airport, anticipating the media attention and a photo opportunity which would bring them good publicity. An MoD commission was assembled to investigate the case, but it seems only more questions have arisen and that PM Aleksandar Vučić is attempting to whitewash and protect his ministers by any means necessary, while in the process stating facts to the contrary. If this was in fact the case, it turned into a marketing fiasco, a grave human tragedy, and a loss for Serbia’s defence and healthcare systems. This tragedy came just days before March 17th, the 11th anniversary of the three-day anti-Serbian pogrom perpetrated by ethnic Albanian mobs in Kosovo and Metochia. The 2004 pogrom claimed 28 lives, 954 people were injured, 930 Serbian houses were burned and destroyed, some 4000 Serbs were forced to flee their homes, and 35 Serbian churches and monasteries were attacked or completely destroyed, some of which date from the 13th century. NATO troops present in Serbia’s disputed province did little to defend the Serbs (with minor exceptions), but shot to defend themselves against attacks by ethnic Albanian mobs. On March 18th, only a day after the pogrom anniversary, the aforementioned Defence Minister Gašić and Foreign Minister (former PM) Ivica Dačić travelled to Brussels to sign Serbia’s Individual Partnership Action Plan (IPAP) with NATO. IPAP represents the highest level of cooperation possible between the alliance and a non-member country, and signing it constitutes a direct violation of the country’s neutrality proclaimed by the Serbian parliament in 2007. Even before this pact, Serbia moved towards ‘professionalization’ and ‘modernization’ of its armed forces along NATO lines. The result of this process was the degradation of the army – its shrinking, the scrapping of huge amounts of ‘surplus’ ordinance, and the restructuring of forces to reach compatibility with NATO. NATO integration of all Eastern European countries brought a true invention of post-modernity – it is the first military alliance in which a country disarms rather than arms itself. For Serbs, IPAP may mean sending cannon fodder to different parts of the world to fight for US foreign policy. The wave of protests seems to be gaining some momentum. A long lasting teachers' strike culminated in a mass protest on March 17th wherein about 10,000 took part and confronted the Ministry of Education against the decrease of their already low salaries and layoffs coming as a result of the Serbian government’s agreement with IMF. The political movement Dveri organised a protest on March 21st against a range of governmental policies – IPAP, the IMF deal and ‘Tony Blair’s government,’ as they call the Serbian government which took the former British PM as their advisor. This move of PM Vučić’s cabinet is more then controversial, as Blair was one of the loudest warmongers during the 1999 NATO aggression against the Federal Republic of Yugoslavia. The protests of the opposition – both patriotic and pro-Western – will continue. Dveri announced that they will continue in the nearest future with the ambition of rallying around them all patriotic opposition, trade unions, and discontented. The Democratic Party of Serbia will organize a rally in Kosovska Mitrovica (the largest Serb town in Kosovo) on March 23rd, while the Serbian Radical Party will organize their rally in Belgrade on March 24th, on the 16th anniversary of the beginning of the NATO aggression. The pro-Western Democratic Party also announced that it will start rallying its supporters in anti-government protests. 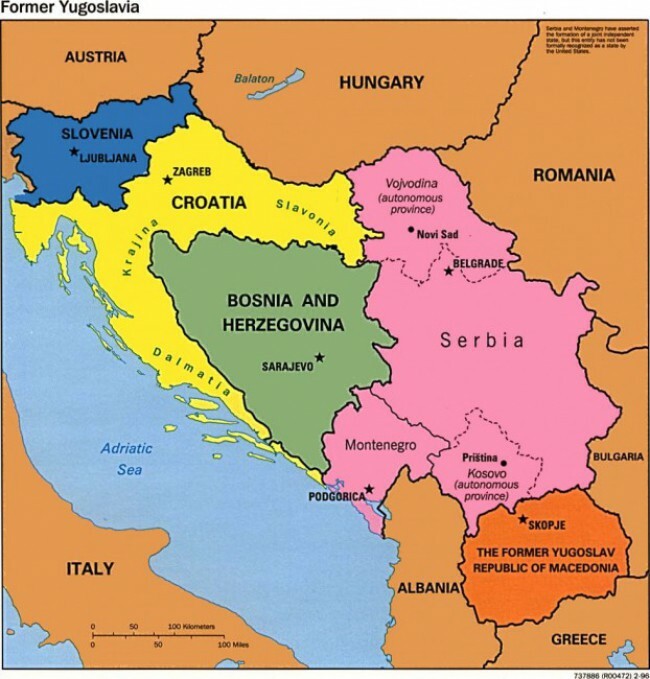 Concerning other post-Yugoslav countries, events in the Former Yugoslav Republic of Macedonia have been very interesting. On January 31st PM Nikola Gruevski assembled journalists to a press conference wherein he presented a video in which his main opponent, Zoran Zaev of the Social-Democratic Union of Macedonia, attempted to blackmail him (in the PM’s cabinet), claiming to possess a substantial amount of compromising material on him obtained from unnamed foreign secret services. Gruevski characterized this as an attempted coup d’état and Zaev has been barred from leaving the country. Immediately after the press conference almost all Western embassies strongly accused Gruevski of suppressing democracy in Macedonia – only the Russian Embassy took a diametrically opposed view of the events. Zaev started a campaign entitled ‘Truth for Macedonia,’ wherein he plays several secretly recorded phone calls between Gruevski and his party comrades of different governmental levels. Zaev is attempting to spin the case – rather than falling into political ruin due solely to his discrediting as a foreign secret service collaborator, he seeks to divert the public’s attention to the materials he claims to have received from foreign intelligence. Besides the Western embassies, Zaev finds support in this endeavour from a number of local and regional TV stations. On March 18th Al Jazeera Balkans broadcasted a story portraying PM Gruevski in an extremely negative light, while interviewing only pro-opposition Macedonians. The story behind the whole case seems to have geopolitical roots. The US is far from pleased that Macedonia will gladly participate in Gazprom’s project colloquially referred to as Turkish Stream, a substitute for South Stream which failed due to open obstruction from the EU and the Bulgarian government, whose foreign policy is driven not by their own interest, but rather a blind following of US directives.